Good service at check in and check out. Great location once we found it. New road signs would help with all the road construction. Excellent service. Great location. Nice rooms. Our only issue was very minor - inconsistent hot water in the shower and we had to fix the toilet from constant flow. 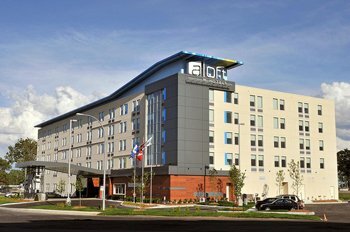 First time using Aloft Montreal Airport, overall my family and I enjoyed our stay and would recommend using their park and sleep package. Only two areas to note for potential improvement, would be 1) the breakfast offered as part of the package was much less than other spots we have stayed at for approximately the same price; and 2) I didn't catch it but we had paid for 2 extra days parking in our package but the voucher we where given from the hotel was only for the standard 8 days parking versus the 10 days I had paid for - luckily I had my original email showing what I had paid for as at first the parking attendant was going to charge me for 2 additional days of parking so perhaps a quick double check when handing out vouchers from both the hotels and visitor perspective will save all some time. Outside of this the service was very good! I only stayed there one short night before departure. Got in at 1am. The person at the front desk was smiling, answered all my questions. I felt welcome. Room was comfortable, spacious and clean. The only downside is that de heating (ventilation) system is very noisy everytime it turns on.